The construction of the Grosse Pointe South High School in 1928 along the shores of Lake St. Clair marked the transition from wealthy seasonal resort area to year-round town. Residents built one of the finest public high schools in Michigan, and as a result, the Grosse Pointe High School has been added to the National Register of Historic Places. Amenities at the school include a swimming pool, five libraries, two gyms, and an auditorium. The Grosse Pointe School District commissioned Counsilman-Hunsaker, in association with Ehresman Associates, to design a new competition natatorium and field gym to complement the Georgian revival architecture of the main 1928 building. Responsible for the design of the new swimming pool, Counsilman-Hunsaker worked though a creative process to develop a unique 7,000 sq. 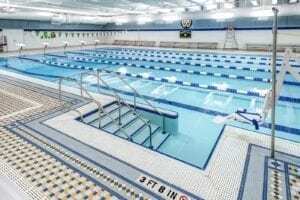 ft. 25-yard 12-lane pool configuration that met the school’s requirements for training, instruction, and competition. Emphasis was placed on having a functional facility that could accommodate several simultaneous activities. 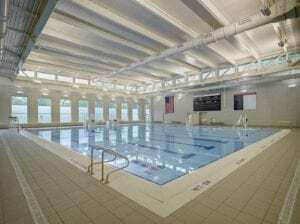 The natatorium also features a state-of-the-art timing system and video display scoreboard.